One of the most common concerns that comes with aging is loose skin. If your skin’s just not looking and feeling as tight and firm as it once did, Aaron Jeng, MD, at Beau MedSpa in Glendale, California, can help. Dr. Jeng uses the highly advanced Cynosure ICON™ laser to tighten, firm, and correct other skin problems as well. To learn more about skin tightening, book your visit with Dr. Jeng online or by phone now. What causes skin to sag or grow loose? Skin starts to grow loose or even saggy over time for one main reason: As you age, your body's natural stores of collagen and elastin start to dwindle. Collagen is the substance that supports your skin while elastin helps you maintain good skin elasticity. You may notice as you age, your skin doesn't quite spring back immediately after you make expressions like a deep frown. The depleted collagen and elastin can have a dramatic effect on your skin, etching in lines and wrinkles that make you look and feel much older than you really are. Fortunately, it's possible to restore volume, smooth away lines, and correct other skin problems like hyperpigmentation all at once with ICON laser skin tightening at Beau MedSpa. The ICON laser delivers powerful laser energy pulses to the deeper layers of skin, where you produce collagen and elastin. The laser heat spurs your tissue into action, producing fresh collagen and elastin. Additionally, the ICON laser agitates your existing collagen, forcing your body to break it down and restructure it. 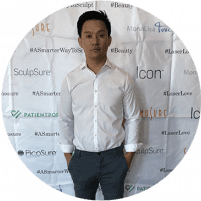 Dr. Jeng performs all treatments at Beau MedSpa himself, and he does everything possible to make you comfortable during your laser skin tightening. Dr. Jeng applies a topical anesthetic cream before treatment starts. It takes your body some time to produce the new collagen and elastin, and it's a gradual process. You'll notice a steady improvement until the full results are evident at about three months post-treatment. After your full results are seen, you can decide whether you want further skin tightening treatments. Many patients are quite pleased with their results after only one laser skin tightening session. If you love your results overall but just want a bit more volume in a certain area, Dr. Jeng might recommend a dermal filler like Juvéderm® or Restylane®. At Beau MedSpa, your treatments are always customized for you, so don't hesitate to reach out for help. Book online now or call the office to schedule an appointment today.